CNC cut from plywood. Designed for Flat-pack transport and assembly in store. Logo cnc routered into side panels. 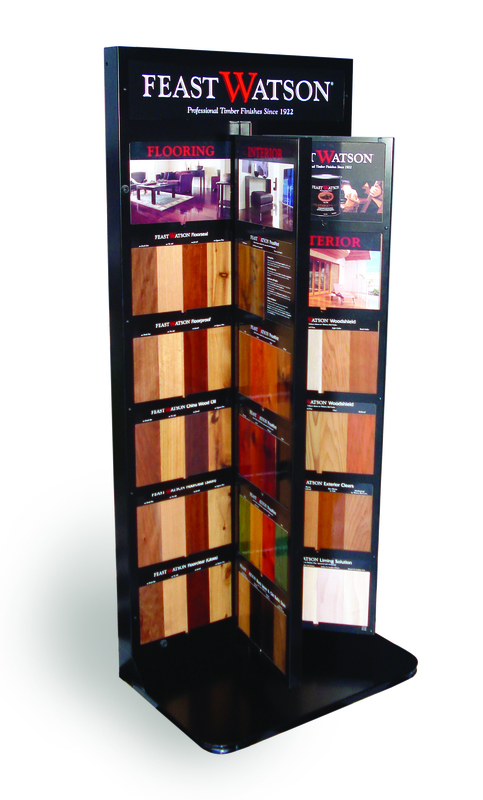 Minimal finishing on timber for a very cost effective, natural looking display. Red Earth at Emporium, Melbourne. Tester panels router cut from Corian and digitally printed for High-end, sheer finish. CNC cut from plywood. Simple graphics screen-printed or CNC cut on side for "crate" aesthetic. Back panels may be placed at 3 depths, allowing one / two or 3 crates to be displayed, without appearing empty. Rounded steel ends offer a great island display. 360 degree access with a massive, inviting stock holding. Interchangeable vacforms and lasercut acrylic panels hold smaller colour ranges on the rounded ends. Storage drawers underneath. Fabricated metal and acrylic. Lighting in side pillars illuminates logo on outside as well as onto interior acrylic shelves. Beach hut themed display constructed from routercut and stained ply. Illuminated poster holders. A standout nailpolish display with stock access from both sides. Compact steel construction on castors, perfect for pharmacies. Interchageable curved graphics on sides. Lasercut double-sided acrylic header. Clear vacforms hold stock neatly on shelves, useful for keeping product stable when wheeling this display out to prime position each morning.The overall feeling is light and bright, with through visibility. Recycling stations for Stonnington City Council. Ply construction with removable plastic tubs inside. Lockable hinged door. Digitally printed graphic panels. Steel construction with matt custom colour powdercoat, vinyl upholstery, and vacform shelves. Printed double sided mirror. Lockable castors. Referencing '50s boudoir furniture, this display is certainly eyecatching and inkeeping with the branding of this range. Unique packaging was one of the key features in this brand. The display features the packs in a futuristic looking, compact floorstand. Packs drop feed and roll-feed in clear modules that clip on to the central column. Textured rubber finishes on the fascia mimmic the internal products. The logo is lasercut into the steel center column. A simple construction from sheet metal. Flatpacked for assembly in store. 360 degree shoppability. Interchangeable lasercut acrylic shelves. Wedge shaped steel lightbox. A modular steel system developed for stock shelving or coolrooms. Developed alongside a promo with toolbox giveaways, this stand had the aesthetic and robustness of a tradies toolbox. Fabricated from gal and powdercoated steel. Vacformed wall tiles, some incorporating the Grab logo, were finished with textured paint. Used in combination with signage for store-in-store fitout. Steel construction, with storage drawers, castors and interchangeable side graphics. Injection moulded dividers and vacform tester trays used for shelf management. Flatpack Plywood floorstand with castors and storage underneath. Shoppable from both sides. Logo screenprinted directly on the sides. Interchangeable header card locates in slots. Steel construction with vacform insert panels. 360 degree rotation. Heavy on education to target the product segment. Steel floorstand with hinged leaves. Vacform inserts house up to 36 panels, each with 4 finishes. 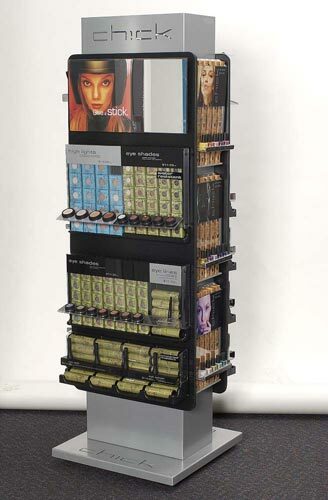 A compact, high quality display used in hardware retailers. Hangsell display cubes, with ample space on each for educational graphics defining each range.Timber body with steel and plastic inserts. T5 flood lighting used. A sophisticated implementation of shelving system including LED lighting, injection moulded shelf components, fabricated and vacformed components and transparent shelf graphics. 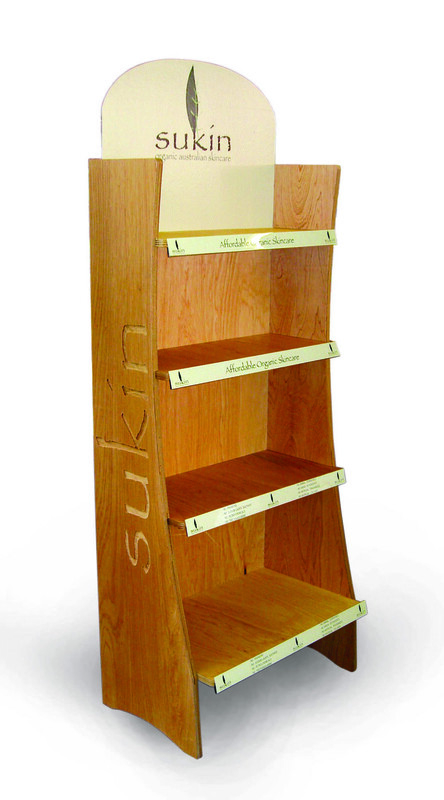 Configured variously to be housed in timber carcasses to suit retailer specifications. A nationwide rollout of this system involved planogramming, logistics, and a high volume of complex work. 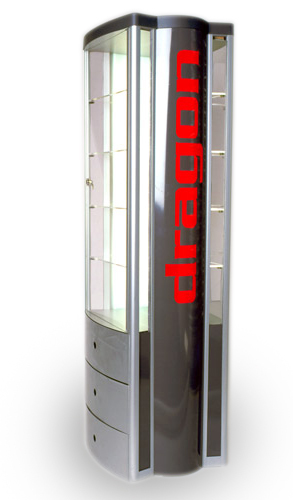 1300+ stands were manufactured and installed over a 6 month period throughout DDS stores in Australia. We are following through with ongoing maintenance, updates and new stores. Steel frame with lasercut acrylic shelf inserts. 2 pack sprayed pink edge details. Steel Sheet construction for hangsell stock, flatpacked for transport. 3d moulded head on top to feature head lamp. Naitonwide rollout and ongoing maintenance to over 1200 outlets. Robust adjustable steel shelf system inside timber carcasses. Flood lighting behind. LED spot light and illuminated "hotspot" Combination of hangsell and engineered trays with push feed, gravity feed and roll-feed components. Timber and composite construction to hold range of nail and eye products. Nationwide rollout from 2005 - 2009. Steel modular construction of body allowed for compact transport of body. Steel adjustable height shelves. vacform insert product trays. Steel construction, with illuminated graphic pillars on each end. 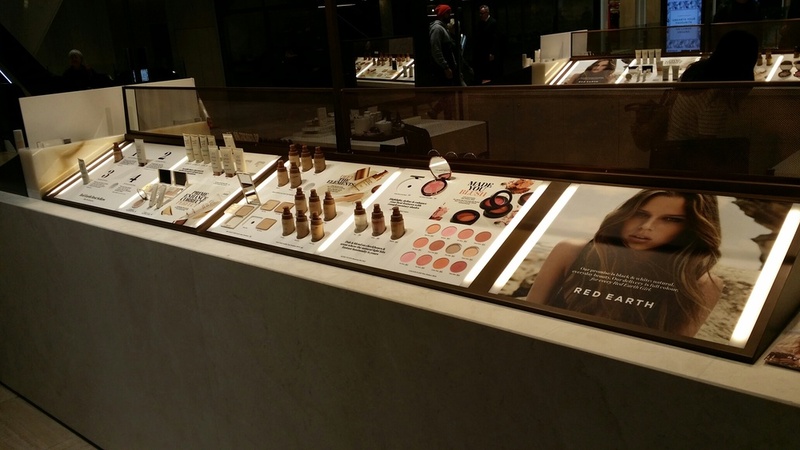 Klara Cosmetics Coles infill. Features etched backlit charcoal mirror, LED lighting, Tester panels with security retraction devices. Push feed stock trays from steel and acrylic.